One of the tools I use to test my CSS is called Firebug. It's an add-on to Firefox which gives you a lot of information about the CSS and HTML structure of a web page. When you have Firebug installed, you can right-click on an element and choose 'Inspect element'. The Firebug window will open at the bottom of the screen. Now, you can see the HTML structure (left) and the CSS (right). 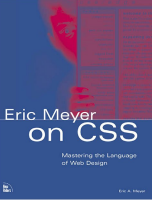 To learn CSS, I always recommend the books by CSS guru Eric Meyer. He has some great insights and a huge knowledge about CSS. He describes the use of CSS in an understandable way, and gives a lot of practical examples in his books. My first CSS book was Eric Meyer on CSS, and it taught me a lot. For instance, he goes through the whole process of turning a table-based layout into a CSS layout. Explaining every step along the way.